I was recently asked to be interviewed about mindfulness for an online conference by parenting coach, Carrie Contey, PhD. She wanted to dive into the concept of mindfulness techniques and parenting – which is so wonderful, how could I say no? Check out this clip of us talking about parents, children, zebras and lions! 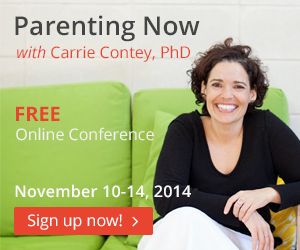 The online conference is FREE from Nov 10-14. It’s called Parenting Now and addresses, “present moment parenting in the 21st Century.” (How fun!) Not only will you get to see me, but you’ll also get access to amazing experts like Dr. Shefali Tsabary, Dr. Tina Payne Bryson, Solomon Masala, Jonathan Hewitt, Teresa Graham Brett, and many more. You can register here and when the conference starts you’ll get notified of how to login and watch the goodness. If this doesn’t sound interesting, let it go without another thought. If this seems like it may serve you, check it out. And feel free to share this with your friends and family. A warm greeting to you. As always, I hope you are experiencing ease and joy in your days. As we settle into Fall, I want to invite you to begin to pay attention. I know, I know, this may seem like another “task,” another “thing to do,” but truly, this is a simple invitation, which you can access at any point. The summer is ending, schedules are shifting, and life is moving. Our bodies feel this transition, especially as the days grow shorter and the holidays become not-so-distant realities. My invitation is to be curious during this time, towards yourself, your heart, your body, and your mind. Mindfulness can be an ally any time, but especially can help us “recharge” during these “restart” times. With mindfulness, you can practice paying attention to each of life’s moments, with kindness and care. Through mindfully, kindly, exploring my own thoughts and heart, I discovered that nature has a profound effect on me. I can still remember the first time I saw leaves that had changed from green to golden yellow and brown. I stared at those leaves and took in all their details – the tiny veins, the hardened feel, the richness of their beauty. I didn’t judge the leaves, I didn’t decide they were more or less interesting before. I was deeply curious in observing them. This is the same practice I work to cultivate in myself. As the seasons change, as the weeks, the days, even the minutes change, so do I. And through that change, I remain curious about my heart, my body, and my mind. Start with one breath. In, out, let it go. Try and relax the body for this moment. Take another breath. In, out, let it go. Allow whatever comes up to be present with gentle curiosity and without judgement. As you continue to breathe and relax your body, notice what you need in the moment. Don’t worry about fixing it, but respond to the need with kindness and care. I send you so much love in this time of transition. May you be well. May the days ahead be insightful for you. 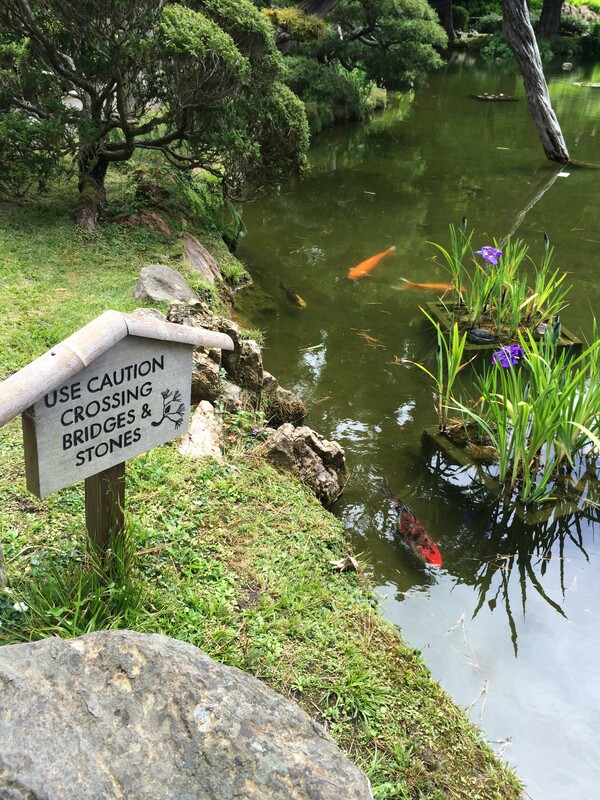 Earlier this year, my travels took me to the San Francisco Japanese Tea Garden. 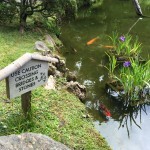 Fresh from the Teacher Development Intensive MBSR course, I felt the poignancy of the moment as I noticed the sign by the pond: Use caution crossing bridges and stones. I crossed over with care and here are five simple things I learned from the experience of mindfully sitting by this lovely pond. We often come to perceive the “bridges and stones” as obstacles rather than places of transition that open up new experiences for us. When we cultivate curiosity to explore what lies beyond the stones and the bridges, it can often lead to finding moments of beauty in simple things. Kindness and non-judgment are helpful friends in navigating difficult paths. Especially when we stumble over the challenges in our lives, it is helpful to hold ourselves without harshness. The attitude of kindness, curiosity, softness and care allow the heart to slowly open. As we open our hearts and minds to just being present, we notice so much more. When we are not looking for something specific, the details of life’s tapestry are exquisite! The gifts of nature and life continue to change every moment. Consider inviting the heart to enjoy just this moment without holding on it to it. Even as an adult, I love a good story. I still enjoy encountering the heroes, heroines, the dragons, the demons and witches of the fairy tales my father would tell us when we were kids. As time has gone by, I have come to see these well-known and well-loved characters in my life not just as mythical beings but as parts of the human psyche – shades of these are in all our lives as we struggle to make sense of the life we are gifted with and how it interweaves with the beings around us. I remember reading Bruno Bettelheim’s book, The Uses of Enchantment: The Meaning and Importance of Fairy Tales as in college. As the years go by, I realize how much resilience, strength and wisdom I still draw from these enchantments. On long winter evenings, I often like to remember stories that the elders in my life have shared with me. Here is one I have heard often over the years – it continues to be a reminder to cultivate the good within us. A friend recently asked me about living joyfully and the mindfulness tools that can help with that. She said she was intrigued with the idea but felt intimidated since she had never done any yoga or meditation. She did not know where to begin the practice of mindfulness and meditation. Notice that you are breathing. You have been breathing all your life, but how often have you noticed your breath? Take a few moments now to notice your in-breath and then your out-breath. And again, notice your next full breath. Try to stay with each in-breath and out-breath for the next five breaths. Congratulations! You have just taken your first steps in meditation and mindfulness. It is really that simple. Mindfulness is nothing but being aware of what you already have been doing and feeling it in your body and mind. Being aware of your breath is the first and most important step because it connects you back to your body. Pause again. Take a deep breath and gently invite your shoulders to drop, your forehead to relax and your eyes and jaw to soften. Bring your attention to your heart and see if you can bring some tenderness to it. If you are comfortable, lower your gaze or close your eyes and come back to your breath for another ten breaths. Notice the sensations in the body as you breathe in and as you breathe out. If you find it hard to connect to the sensations of the breath, you can bring your hand to your heart or your belly and feel the rising and falling of the breath. If any thoughts come up, notice them and let them go and come back to your breathing. Congratulations! You have now taken the next important step in mindfulness meditation! You have learned to notice your breath and body and any thoughts that might have come up. You have graduated to exploring the mind-body connection. You may have noticed in this short practice that meditation is one of the simplest ways to relax and connect the mind and the body. You may also have come to appreciate the challenges of the uncontrolled thoughts that come up even in the brief time you were focused on breathing. As you continue to breathe for a minute or two, you will notice that inevitably, you will get lost in thought. The moment you catch yourself lost in thought is the moment of mindfulness. It is this moment of awareness that you are lost in thought that is the most precious moment of this practice. That moment is actually the moment when you have found your breath again! So instead of getting frustrated at the thoughts popping up, these are moments when we can congratulate ourselves for remembering to come back to the breath again. And every time you notice the thought and let it go and come back to your breath, you are training your mind. And every time you come back to your breath you are creating a new pathway in your brain, and slowly increasing your neuroplasticity – but more about that in future blog posts. For now, let us come back to our breath and body. I invite you to try practicing again as you read this. Relax your body and feel your breath coming in and going out. It can be frustrating at first to continue to notice the number of unbeckoned thoughts that come up! One client found it useful to smile and say “hello” to the thought that came up and then say “thankyou” when she first started mindfulness meditation. She was able to notice the thought that came up with a light hearted acknowledgement and then just as quickly release it without a reaction or attachment to it – without following the thought with another thought to get lost in the story that spins out of thoughts. Then she came back to her breath. It is very important to know that you are not trying to get rid of the thoughts – you are just trying not to feed and follow a thought that comes up. You are also not trying to choose to control your thoughts to be pleasant or unpleasant. Just notice the thought as it comes up and let it go and come back to the breath. Relax your body before you start and gently bring attention to the present moment. Simply notice your in-breath and out-breath and the sensations of each breath in your body. Without judgment and with a kind and patient heart, notice any thoughts as they arise in your mind and pass away. Remember to come back to your precious breath – your perennial companion in life – the moment you notice you have strayed way from it. You are invited to repeat these steps a dozen times, hundreds of times and even a thousand times as you practice… Being patient and compassionate as you train the only mind and heart you will ever have toward greater joy and stillness. I invite you to try this meditation practice every day. You can start with just two minutes a day in the morning and a couple of minutes before going to bed and increase the time as you get more comfortable. Congratulations again! You are now on your way to joyful living. Mindful living calls us to bring attention to the present moment – without turning away from anything. Accepting things, as they are – pleasant, unpleasant or neutral. It also calls for doing this with a tender and compassionate heart toward ourselves and towards everyone and everything around us. 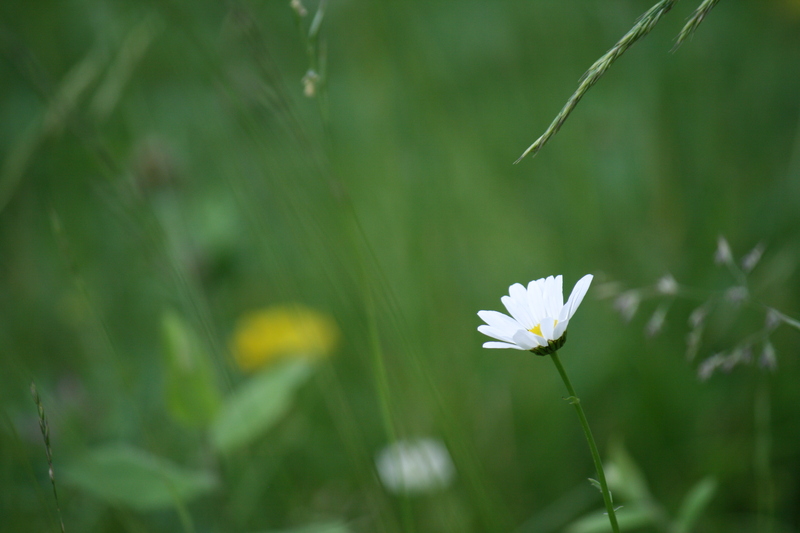 When I first was introduced to the compassionate part of the practice, I thought it seemed a little too idealistic and too impractical for the day-to-day challenges. Compassion was easy to feel on a silent retreat at a secluded beautiful monastic center on a warm sunny afternoon – but I had my doubts if it would work with everyday stress and urban living. One of the comments on Facebook for my last blog post asked me: “Which is the best tool to deal with stress created by traffic in cities?” It prompted me to think of my “before and after” experiences of driving in rush hour traffic. For many years, before I started my mindfulness practice of paying simple attention to breathing and daily meditation, I used to rush through life – always feeling like I had to get so many things done with so little time on hand. I worked for several years at the University of Texas in Austin and my daily commute was often a crawl that averaged 10-15 miles an hour. Looking back I am amused at my daily reaction to the traffic jams. Every day I would get to the backed up ramp and tense up and sigh. Why was this always a frustration and surprise… should I have expected anything else after years of that same commute? Somehow there was still an expectation and fantasy in my mind that it would be different every morning – and every morning I was disappointed and upset that I was stuck “wasting” time because of all these cars that were “in my way!” I have to laugh at the fact that I never saw myself as part of the problem, never saw that I too was one of the hundreds of cars that were slowing every other car down. We all had places to get to fast, and we were all stuck – all of us trying to control a situation that none of us could control! The worst emotions came up when there was a merge in the road. Every day my heart would contract and I would feel angry at the cars cutting in front of me out of turn. I would try to make sure I edged up every inch to not let anyone in – so I could reach just a second or two earlier to my final destination! And when someone else was more aggressive than me I often muttered some expletive under my breath – never seeing my own behavior not being any different than that of the other car. I even remember being exasperated with cars that slowed down to let other cars in… Every day this battle was fought, and every day I arrived at work gripping the steering wheel with considerable force and was usually pretty exhausted from this ordeal. It was often worse on the way back home, when the stress of my workday compounded the stress of the commute and shortened my patience and perhaps my life a little more than the morning commute. I don’t ever remember myself breathing or noticing the lovely wildflowers of Austin along the roads. And even now, as I write about it, I find my heart contracting, my shoulders hunched over and my jaw clenched! Yikes!! In the years since, I have started a daily meditation and mindfulness practice. I have been surprised at the results over time. Slowly I have started bringing mindfulness to my everyday life. I have started being aware of the sights, sounds, smell, tastes, touch, and thoughts I have. Most importantly I have started viewing the world with my heart and my mind. I am slowly awakening from the auto-pilot mode of life I was in. Here is what happened when I was stuck again in traffic on the same road at the height of the rush hour just last week. I found myself taking a deep breath. These were my thoughts: This is the way it is. Nothing I do will change anything or get me home faster. I might as well just practice being present. I relaxed my shoulders and started to pay mindful attention to what was around me. The first thing realized is that I was noticing the people in the cars instead of just seeing the cars on the road. I could feel that the people around me were people with hearts just like me, with their own stories of joys and sorrows and like me, each one was trying to do the best they could to just navigate through the traffic and indeed through life with all its gifts and challenges. There were several people talking animatedly to themselves – a few years ago they would have been considered “crazy” but with the advent of Bluetooth, it now seems perfectly normal behavior. There was a woman driving with three kids who were demanding a lot of her attention. There was an old man really trying hard to merge into my lane and I slowed down to let him in. I saw him wave with gratitude when he got into the lane. I was touched by that simple gesture and surprised by how good my heart felt with such a small act of generosity. I saw a couple arguing furiously on one side of my car and on the other I saw a young woman jamming to music and singing at the top of her voice. I saw a dog sticking his head out of a car window, enjoying the afternoon and looking like he was laughing at this whole show. I realize that I was really seeing my fellow commuters for the first time with my full attention. And naturally my heart opened up with a wonder about all the lives around me – their sufferings and their joys. The commute felt much faster than usual and I came home with a feeling of having been touched ever so briefly by these lives that brushed past me. All of us on that road had our own dreams and ambitions, our joys and tears, our heartaches and triumphs. I felt gratitude for being part of this crazy but gifted life that we all share. So what are the tools that shifted my response to the same traffic from extreme stress to this true appreciation of being alive? I started by coming back to my breath and relaxing my body. It seems too simple to be true – but the first step really is as simple as that. This simple act of constantly coming back to noticing our breathing helps to cultivate our daily mindfulness. Over time I have learned to let go, be and relax my body. And with time, I do notice that when I give up my struggle of trying to change or control situations I can come to actually enjoy life much more with all its colors and shades. I am certainly not perfect all the time, but I find that I am starting to incline more and more toward kindness and compassion when I create this space to notice life in the present moment – just one breath at a time. My commute times have not improved but I am gifted with much more grace and joy because of this simple shift of perception. A frequent question: How can I receive email when you post a new article or event announcement to your web site? If you’re interested in staying in touch, here are several options that will notify you automatically when I post new information. On the right hand side of my blog, you should now see a subscription form. Type in your email address and click on Subscribe. To protect you against spam, you will immediately receive an email containing a confirmation link. You must click on the confirmation link to confirm that you do want to receive the email. Once you do so, you will receive emails whenever I make a new post. My web site supports the RSS Rich Site Summary feed format. Just add my RSS Feed to your favorite News reader. If you are interested in exploring News readers, I can recommend Feedly. Visit my Joyful Living Facebook page and click on Like. My new posts will be displayed in your Facebook News Feed. Visit my Google+ page and add me to one of your circles. If you are one of my LinkedIn contacts, you should see my posts in your LinkedIn news feed. To become a LinkedIn contact, visit my LinkedIn profile and click on Connect. Visit my @JoyLiving Twitter feed and click on Follow. Starting anything – a new journey, a new practice, a new day or even trying out a new recipe – is a journey of peeking into the unknown with a trust in our self that we are open to the adventure of the journey. We do this every day in countless ways that we are not even aware of most of the time. We take the extraordinary act of living an ordinary life for granted. Mindfulness brings back the joy of adventure in our daily lives. With great tenderness and curiosity, we are invited to be present to every thought in our mind and every emotion in our heart regardless of them being pleasant or unpleasant. Without judgment, we watch our selves start living our lives with grace and gratitude. Hiking and walking in nature have offered me great teachings on mindfulness. Today my lesson begins when I sit down to tie my shoes. I am amazed at the awareness and knowing that teaches my fingers to pull the laces just right – not too loose to come undone and not too tight to constrict my feet. It has come from learned habits formed in childhood. There is wisdom of the mind and the body that knows how to take care of me. I don’t’ even have to think about the pressure on the laces, my body and mind know what they need. And yet, so many times, when I have been in a hurry and not paying attention to the simple act of tying my laces (often thinking ahead to the hike and the trail instead of being present to the task at hand), I inevitably start off with discomfort on my hike which often goes unnoticed until it becomes a bother… it takes attention away from the beautiful hike – unconsciously I start to look for a spot to redo my laces. I miss the flowers blooming, the butterflies fluttering or even the occasional low hanging branch that I should avoid because of this small stressor of trying to right something that I would not have needed to do if I had not been preoccupied with my thoughts of the future. And now that I am in that future, there is the smallest little judgment about the past popping up – I should have tied these laces better… how many times have I tied laces before… and so it goes into a spiral that will become its own vortex. Pause. Breath. I am curious about the difference between the times when I tied my laces right and when I did not. The difference is simple. The wisdom and learning of my body kicks in when I am calm and present to the simple task of tying the lace – and I do it “right” when I do it with attention and care. When my mind is distracted, I still have the muscle memory of tying the lace but it is done with carelessness, which most likely will create a need for attention and judgment in the future. This is of course the simplest example of how we often generate needless loops of suffering which leads to stress in our lives. This example is also a gentle reminder as we start on this path of mindfulness. The first thing we learn in mindfulness practice is to pay attention to our breath. It is the simplest thing to do – since we have been breathing all our lives. And yet as we start paying attention to it, it can be amazing how hard the simple act of staying with the breath with mindful non-judgmental attention can be. 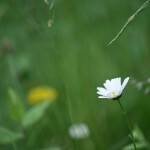 The invitation of this practice is to gently learn again and again to come back to these simplest and hardest of things. Just being present with whatever you are doing moment-to-moment. And realizing that every moment we have is nothing short of a miracle!